Versatile and inexpensive, bleach is not just a laundry booster. This clear liquid disinfects hard surfaces, killing bacteria and fungus. Unfortunately, bleach has an unpleasant chemical odor that can last long after you have put the cap back on the bottle. Walls, carpet, clothing and furniture can trap the bleach fumes inside their pores and fibers. Fortunately, a few common products will help remove the bleach odor. Inhaling bleach fumes can cause watery eyes. Containing sodium and chlorine hydroxide, bleach is a toxic and dangerous chemical that can fill your home with harsh residues and fumes. The strong odor that accompanies bleach can last for days after you have used the chemical and can cause headaches, nausea, fatigue and burning of the eyes, nose and throat. When working with bleach, always ventilate the area by opening doors, windows and turning on fans. This will help keep the air circulating and reduce the amount of bleach fumes. Adding too much bleach to the washing cycle can leave a strong bleach odor on laundered items. The smell can persist for days after laundering, and cologne or perfume simply mask the chemical odor. Try rewashing the item in cool water with 1/4-cup of laundry detergent. When the washing machine reaches the rinse cycle, add 1 cup of white vinegar. The vinegar removes odors without chemicals. 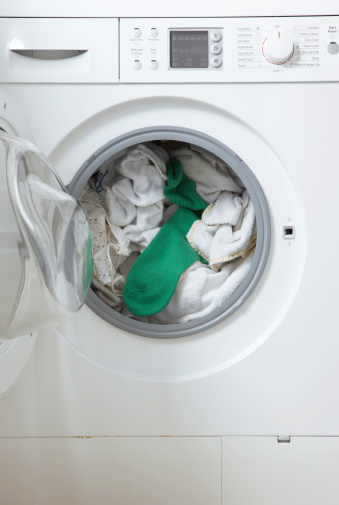 After the washing machine completes a full cycle, remove the items from the washer and put them inside the dryer. Lay one to two dryer sheets on top of the damp items and tumble dry. If the bleach odor remains, soak the items in a bucket of cool water for several hours then rewash. Since you cannot simply toss non-washable items into the washing machine, you will have to remove the bleach odors by hand. Fortunately, baking soda and vinegar -- both natural and safe products -- will remove the bleach odor from both hard and soft surfaces. Baking soda sprinkled on carpets and left to sit for several hours will remove bleach odors. This same process also works on upholstery. Another option is pure, undiluted white vinegar. Dampen a cloth in the vinegar and wipe down hard surfaces that smell like bleach. As the vinegar dries on the surface, it will remove the bleach odor. Never mix bleach with ammonia or products that contain ammonia. Combining these two cleaners creates toxic fumes. If you encounter bleach fumes, move to fresh air as soon as possible. If bleach comes in contact with eyes or skin, flush the area with cool water for 15 to 20 minutes. If you experience irritation or difficulty in breathing, contact your primary care physician immediately.